How many ears have heard that stated by someone since Reverend Graham died? How many have read it time and time again, as you read through various posts on social media since Feb 21, 2018? Statements declaring the impact he had on individuals all build the legacy of life that Billy Graham left behind. A legacy of his life, his calling, his purpose. A purpose that was God given. In that way, he was nobody special. Scripture tells us that God has a purpose for every life. As Reverend Graham spoke at crusades his message always pointed to the cross of Jesus. As we listen to all of the various postings of late that are recordings of him preaching to stadiums and coliseums filled with people, it’s always rooted in the cross of Christ and the gift of salvation. It was the most important thing on this earth to this not so ordinary man. When I look at an individual like Billy Graham, it is easy to see that he was used by God in a mighty way. When I examine it a bit more closely, it is easy to see parallels of his life’s calling to many I know. As he preached to the masses about the salvation Jesus provides, is it not comparable to the single mom who shares Jesus over a cup of coffee with a neighbor in need of that very gift? When I read of his outreach to people internationally is it not comparable to the missionary serving through a clean water ministry and at the same time sharing the true water of life? As we watch those lining the highway waving and holding signs to acknowledge a memory, is it not comparable to the family that memorializes the patriarch that died and everyone shares a memory of his impact on their faith? As the hearse carrying a simple pine box, traveled the roads of North Carolina with his remains inside, we experience the tangible reminder that all of our lives will end. Some “change addresses,” as he referred to his death and homecoming in heaven, with little to no recognition at all. Others move from this world to the next with much fanfare. In the case of Billy Graham it is rightly so, as millions it is told, have some link to him and their knowledge of Jesus. The truth is, we will all face our maker one day. We will all be confronted with the reality of having trusted Jesus with our lives or not. This one choice determines our permanent address, where we will spend eternity. I served at a Billy Graham Crusade in 1994. Little did I realize the value of that memory and the deep sense of pride I would feel as I reflected back on that experience. 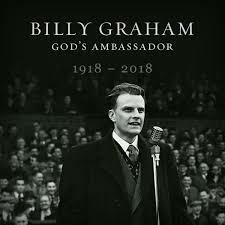 I believe more importantly, it is the parallel between Billy Graham’s opportunity to share Christ with millions and your opportunity to save lives in the work that you do, that impacts me most. In his obedience, his platform was to share with thousands at a time and in the end it totaled millions. Your call to obedience may be touching one life at a time. Both are equally important in God’s kingdom are both are rooted in obedience to Him. 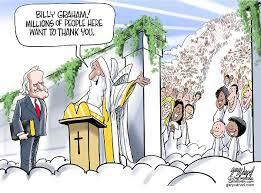 In this cartoon of Billy Graham entering heaven, he’s being told “come in, there are millions waiting to thank you.” What a homecoming for him! Those I work with in the life affirming clinics across the country, will share in such a welcome. That welcome will include men and women who came to your clinic intentionally or unintentionally and met Jesus there. It will include men and women who were able to live their lives, thanks to your efforts. It will include children who’s lives were taken after facts were shared—circumstances just too big to see beyond. Yes, many are leaving a legacy of impact. It can be hard to see this tapestry when you have an idle day in the clinic, but you are there, ready. While I can’t refer to him as a friend as some do, and I never shared a meal table with him or chatted it up about some world topic, I can appreciate his gracious humility. I am thankful that while I couldn’t fully appreciate at the time, God had plan for me to serve with this mighty warrior of this generation.